Good evening! Tonight, some specials on a number of very special artists. LISTEN AGAIN link at the bottom, download our soundz. I'll get to Foetus in a minute - started with one of a number of amazing tracks from his new album. 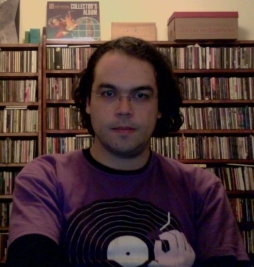 But first off, I was very sad indeed to learn this week of the death of Peter Moskalyk, main guy behind breakcore emo-pop band belladonnakillz. I've been a fan since before the first album came out, and considered him a huge musical talent. With hilariously (if now ominously) nihilistic lyrics, brilliant breakcore programming and unreasonably catchy melodies, he'll always have a place in my heart. I hope you enjoyed the tunes tonight. So, JG Thirlwell, aka Clint Ruin, You've Got Foetus On Your Breath, Scraping Foetus Off The Wheel, just plain Foetus, and more recently Manorexia and Steroid Maximus. And let's face it, a bewildering array of more monikers. I think of his early work as pioneering industrial music, from way back at the start of the 1980s. There's no doubt he was a bit influence on Nine Inch Nails and others at the other end of the decade. He also played with totalitarian imagery and pretty extreme lyrics, in keeping with the punk/no wave attitude. But along with the abrasive personality, which comes out in the vocals as well as the percussive music, there's always been a desire to create bombastic, fully-orchestrated classical music, soundtracks, big band pieces and more. And these days he can be found scoring the Adult Swim cartoon The Ventura Bros and composing for the Kronos Quartet. So while I love (really love) the weirdass instrumental mayhem, it's nice to have a new album from Foetus proper. I went back to the '80s stuff, with 1983’s "I'll Meet You In Poland" featuring confronting (if perhaps hyperbolic) lyrics, drum machines, sampled and looped vocals. We also had one remix each from his two remix albums, very different and very UFog I should think. He's a one-of-a-kind artist and well worthy of your attention. After all that masculine energy, it's time for another special, on the very awesome Gail Priest from Sydney. As well as having written Experimental music: audio explorations in Australia, Priest has released a number of wondrous recordings, and her new album is out right now. It will be launched this coming Saturday, 6th of Nov, at Hardware Gallery, 263 Enmore Rd, Enmore. Her music combines electronics with processed and multi-tracked vocals and other sounds. It can be beautiful and scary, and is always highly evocative. Also rather wild and free is the solo music of Avey Tare, of Animal Collective. I really love the track from 2008’s Living Bridge compilation — I still think it's unequalled by anything on the new album, with its gorgeous piano lines, pitch-shifted vocal samples and great poise; but still, there's some ultra-catchy stuff on the album. I also do love the way the second-last track runs into the familiar (FBi-)radio hit "Lucky 1". Next special of many tonight is Benoît Pioulard, musical pseudonym of Thomas Meluch, who also has a new album out. It's more of the same, but with a sound as beguiling and hard to pin down as Pioulard, that's a great thing. You've got abstract drone/noise works and beautiful indie-pop ditties, all in a lo-fi vein. Fans will rejoice. Of Happenstance I don't know many details, but I do know it's a duo featuring Chris Stewart, who also releases wonderful folktronica as need more sources, as well as contributing vocals (at least) to many releases by the boats. The Happenstance 3” is the last releases on the mobeer sub-label of moteer. I always loved the concept of 3” CDs attached to beautifully-designed beer mats, but I guess it's a labour of love, not finance, as ever. The music is subtle and awfully pretty. Do whatever you can to track these three releases down — the third being a mini-album by needs more sources released on the always-insanely-limited cotton goods. Brief neo-classical detour via prepared pianist Hauschka, whose new album exhibits more of the lovely chamber arrangements as well as his piano playing. And then a few analogue synth concoctions. From noise artist Rene Hell, something surprisingly lovely and sensitive (also highly limited). Then Ben Vida collaborates with UFog favourite Greg Davis; much of this album is very abstract in its bleeps and blurps but this particular track is gorgeous. And penultimately, Mark McGuire from psychedelic electronic band Emeralds has a mostly-guitar-based album of similar minimalism out. Final bonus track is the only track I like from the new Owen Pallett EP — perhaps surprisingly, since I'm a fairly rabid fan. I think it's a bit of a throw-away release, but this one track has his usual flurries of strings and lyrics. Good evening! It's that time of year again, when we ask you to give a little back, and become a supporter of our wonderful radio station, FBi. And LISTEN AGAIN to this show via the link at the bottom of the playlist! Tonight, an interview with the lovely Sophie Hutchings, whose piano-based solo album Becalmed was released on Preservation recently to rave reviews worldwide. Full disclosure: while I had nothing to do with the album, I am playing cello with Sophie at her album launches this week: Thursday and Friday at Ravál in Surry Hills. We heard a number of lovely tracks from her lovely album, and a bit of a free-ranging chat as well. One of the big highlights for this week is David Sylvian’s new release, an album of collaborations from the last decade or so. First track we heard was the title track, "Sleepwalkers", featuring the music of German improv/postrock/glitch hero Martin Brandlmayr. And also in the early stages of the show, a favourite from his Nine Horses group, stop-start samples and Sylvian's vocals offset by the shimmering Stina Nordenstam. I only managed to fit in one track tonight from the new Hauschka album, but you'll hear more if you tune in in coming weeks. It's up to his usual excellent standards, with prepared piano joined by immaculately-arranged strings. Someone give him a movie to score! After Sophie's piano, it seemed right to move on to James Blake’s latest EP, telling titled Klavierwerke. Released on the rejuvenated Belgian label R&S Records, it features Blake on piano along with the sound he's become famous for in the last year or two — incredibly poised production, perfectly chopped micro-samples of soul tracks (I guess), pieced together with plenty of gaps that only serve to emphasise the emotional impact, not to mention the head-nodding goodness. His remix of Mount Kimbie’s "Maybes" is also worth mentioning, for the gradual coming-together of pads and bass over a simple 2step beat. Magnificent. Danish trio System, previously known as Future 3, have their own line in clicky minimal dub-influenced electronica. All fine musicians in their own right, it's great that they're still continuing as a trio too, and their latest album bears a bit of a dubstep influence on a few tracks, as we heard here. Back with Sylvian, and a track from way back in 2001, made for French electronic artist Readymade. Nice skittery 2step-like beats which seem to work very well with Sylvian's vocal tones. I thought it was worth hearing where Sylvian came from, so we journeyed back another two decades to Japan’s most celebrated song (I think), the spectral new romanticism of "Ghosts". Then, back in 2004, my introduction to the wonderful Sweet Billy Pilgrim was via their stunning remake of Sylvian's song "The Heart Knows Better". One of his most prominent appearances in the UFog world in the last while was on Fennesz’s Venice album. As mentioned on-air, I found Sylvian's voice (that vibrato-laden baritone) jarring on the album, but it sits perfectly among his own pieces here. And to finish up, a solo piece in which our narrator is silenced; and it's a wonderful piece of guitar and noise that I'd love to hear more of in the future. Newman's Audiobulb label has been going for about 7 years now, but his own solo albums didn't really appear until the last couple of years. Two archival albums have been released to catch up some of his older material, and along with his albums proper, they show what a creative voice he represents in the electro-acoustic world. I love music that's puzzling and confounding. A convenient link from the label that released Autistici's Volume Objects in 2008, 12k, takes us to the new album from Seaworthy & Matt Rösner, who are launching this album in a double album launch with Sophie Hutchings on Thursday. Unfortunately all I've been provided with (so far) is a very brief two-track sampler, but by the sounds of it it's gorgeous stuff. I'll make sure I get a copy! Finally tonight (and again, I'm sorry there's so much I didn't get to! ), we preview a new 3” from The Declining Winter on the scarily-titled secret furry hole label. The track we heard is a new direction for Richard Adams' band (in this case I'm guessing it's a solo work). It sounds like queasy vari-speed tape experimentation, with vocals submerged somewhere in the mix. From earlier in the year, the track "Red Kite" showcases bandmate Sarah Kemp aka brave timbers’ multi-tracked violins, and demonstrates Richard's growing songwriting skills. His old band Hood (which I still hope is only on hiatus) wrote a lot of my favourite music, but little of it is what you'd call catchy songs. That said, "I've forgotten how to live" is one of the most touching indie songs ever. "Over the land, over the sea" on the other hand is not a pop song at all, but is an utterly perfect piece of music, with a jazzy postrock breakbeat, chiming guitars, violin, sub-bass injections and samples of prior collaborator doseone. One of my favourite tracks by one of my very favourite bands. Back from the amazing Sage Francis, whose set I had to leave early, but huge thanks to Brooke Olsen for doing an extra hour of Sunday Night At The Movies, or rather doing the first hour of Utility Fog for me! LISTEN AGAIN to the shorter, smaller download via the link at the bottom! If you follow me on Twitter, then my apologies you may have heard me proclaiming that anbb’s album mimikry as a potential album of the year. And it is pretty incredible. The surprising combination of two really important Berlins — Alva Noto’s minimal electronic wonders (he runs the iconoclastic raster-noton label, famous for its minimalism in packaging as well as music), and Blixa Bargeld’s impeccable heritage in industrial and post-punk music — creates something utterly logical and somehow totally unsurprising, but totally inspiring. Blixa's was the striking voice of the iconoclastic Einstürzende Neubauten, whose live shows back in the day were legendary for their destructive power. The first track I played is perhaps not as old and noisy as all that (it harks from 1985), and shows their place in the sound that influenced the second wave of industrial — NIN etc. And then from 2004 an utterly classic track that exemplifies their "quieter" period :) And isn't a million miles from the anbb stuff, perhaps. On to another brilliant release from this week, although this one is a promo and isn't actually out till next month. Inch-time’s new album appeared on last week's playlist and is a beautiful and warm piece of electronica. This week I received the remix album, which is an excellent indication of how good the label that Stefan Inch-time has setup to release this is going to be. A very well-chosen selection of artists have turned in some brilliant work, as we hear over the three tracks here. First off, Canberran heroes of postjazzrocktronica Spartak give us an indication of their new electro-pop leanings with an incredible remix featuring vocals from both the boys and some great keyboard programming and beats. Then after a beautiful and appropriately-titled dubby track from Inch-time himself, we have a downtempo offering from UFog favourites Icarus — organic programming and lovely sounds, one of the best things Icarus has done lately dare I say! Finally, apparently a completely new artist. I can't find anything about Tristan Coleman on the net, or his Old Growth In Asia, but his track is top-notch. Need Moar! Next up we have a reminder of the classical-inspired dubstep-tinged beats of Nosaj Thing, in order to lead into Busdriver’s vocal-based cover of the same track. It's from a fun and FREE collection of his called Computer Cooties that you can get by giving him your email address. Do it, not just for the Nosaj cover — plenty of goodness there, including the unhinged "Deer God', which successfully homages and parodies the Monsters of Folk and the Roots' "Dear God", and the unrelated and far superior XTC classic of the same name. With an intimate relationship with said deity, Sufjan Stevens follows, from another download release. "Arnika" is typically beautiful and inventive. Sufjan's on a real roll at the moment. This brings us to another special of the week, which I wasn't able to include in last week's show. Best compilation of the year, maybe — from Boomkat’s 14tracks, a focus on the Digitalis label, and specificaly with a whole lot of out-of-print, very limited cassette releases. First off is angels in america, about whom there exists essentially no information on the net (love it! ), but this is sludgey noise of the highest order. And before a brief break from Digitalis, we have Adelaide's sanso-xtro. Melissa Agate used to play in '90s rock band Sin Dog Jellyroll. Her solo stuff couldn't be further from that; cute synth lines, with vocals entering later. So great to have an Aussie artist as part of this brilliant unearthing of Digitalis gems. Best known to us for playing violin in The Declining Winter, Sarah Kemp here lights out on her own as brave timbers. Mainly acoustic violin and guitar, with some field recordings, it could end up being little more than very pretty, but beautiful harmonies and some very adept multi-tracking turn make this album highly recommended. The first very-small-number also came with the Woodwork EP of remixes, including our friend fieldhead, who works his crosschained-2step/drone magic on the opening track. Two more tracks from Digitalis follow — first off, the not-at-all-little-known Peter Broderick, whose Duets release is one of the few I actually have. The banjo and piano here is typical Peter B, simple yet arresting. alphabets, meanwhile, is another almost complete unknown, but at least he has a website so I can delve into some more of his stuff. This manic bit of acid mayhem is strangely reminiscent of early AFX. Finally, I'm still loving the postrock of Sydney's Grün, and this week gave an airing to the longest track from their Greenland album, at almost 9½ minutes. It's jumped out at me on every listen, and here at UFog Towers we pride ourselves at not worrying about track lengths. If it's good it deserves to be played! I am going to see the great Sage Francis this Sunday (sadly without B. Dolan), so I'm going to be starting at more like 11pm than 10pm! Short and sweet show, but plenty of good stuff, so listen in or listen (again) later! Comments Off on Late start this Sunday! HE'S BAAAAACK! 11 hours after the 'Fog finished, here's Paul's Playlunch with Peter. Today's swiftly-organised topic is the letter "C", if it's not obvious. So I got to play some pretty way-out stuff and some pretty beautiful stuff. YAY RADIO!